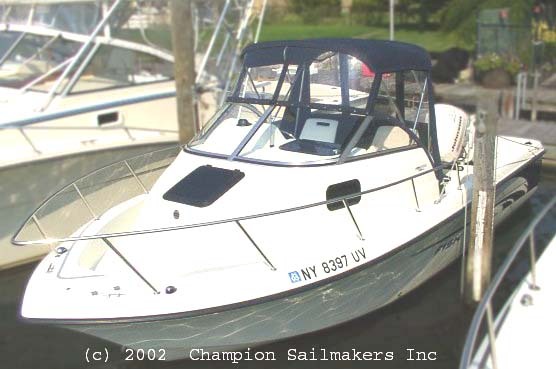 This 2002 21' Bombardier Fish Hawk W/A was purchased from a local dealer here on Long Island. The day the owner bought the boat, he ordered the canvas package from us. Just days after delivery from the dealer, his custom canvas was installed. What we are showing above is a custom Bimini Top and enclosure matching to the style and lines of the craft. Even the color ties in with the side stripes on the hull. Send mail to championcanvas@aol.com with questions or comments about this web site.